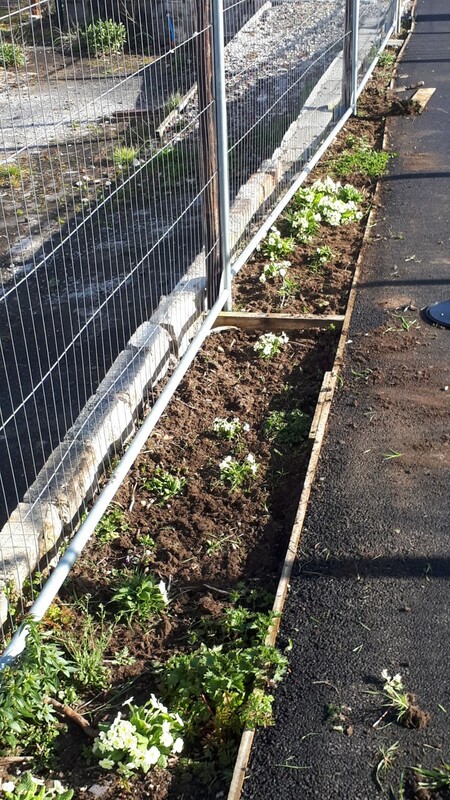 We were back in Coed Gwilym Park in Clydach this week and twenty volunteers came out on a lovely early April spring day. 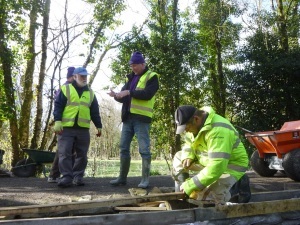 If the names ‘Daubentons’, ‘Barbastelle’ or ‘Pipistrelle’ are familiar then you will know that we are talking about bats. 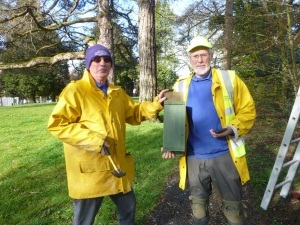 This week Alan and Martin were busy putting up the first of Alan’s hand-made bat boxes. 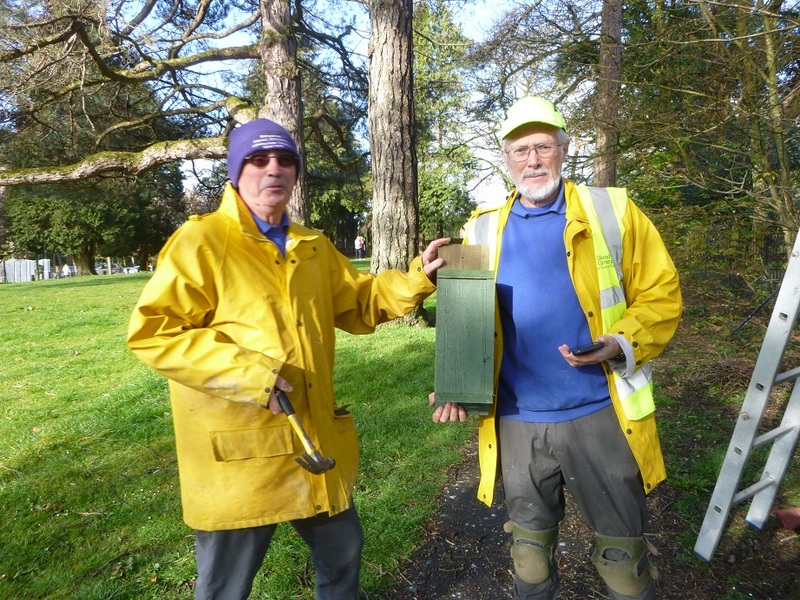 Unlike bird boxes with a hole in the front for the entrance, on a bat box there is a slot cut in the bottom of the box for the bat to crawl up through. Gill and Ronnie set up the craft table on the canal towpath. 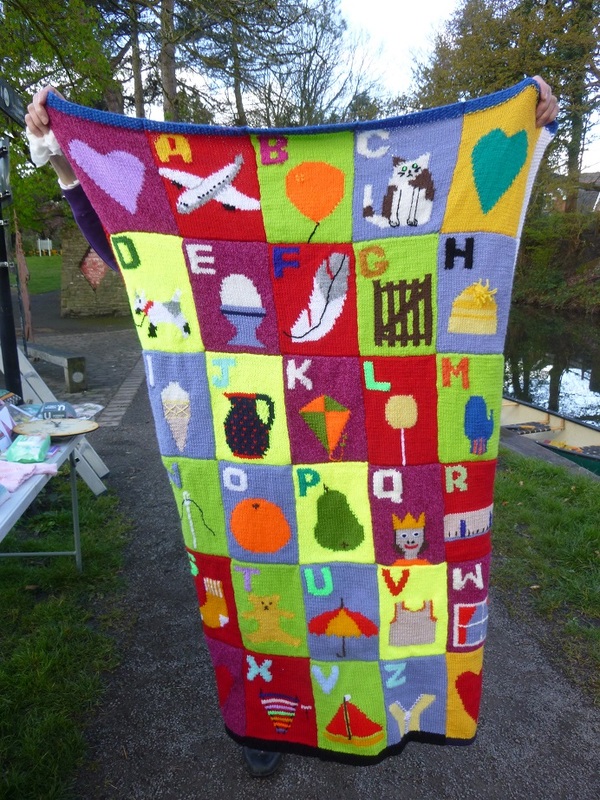 There was considerable interest in a magnificent woollen blanket knitted by volunteer Sue. Such a lovely piece of work. All the craft items are hand-made by volunteers to raise funds for the Canal Society. 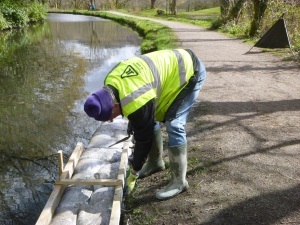 Volunteer Gordon was busy assembling wooden shuttering for the repairs to the canal bank just north of the park. 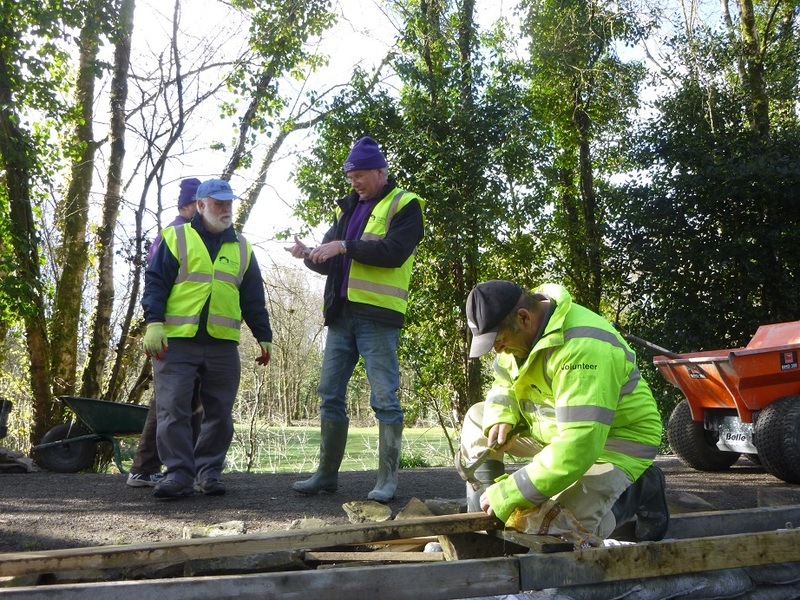 This week Gordon also had a go at driving the powered wheelbarrow. Is there no limit to what this boy can do? 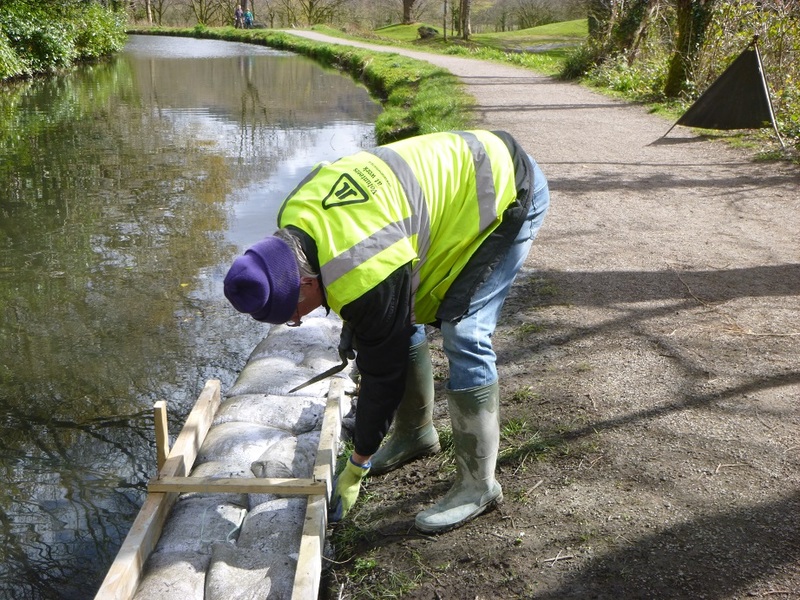 Alan got to work on the laying of stone for the canal wall, and was able to complete 10 metres this week. Meanwhile, further down the canal, our very own Alan ‘Green Fingers’ was occupied planting young primrose plugs. These are the wild species of primrose, obtained from a legitimate source. They will charm and delight visitors for years to come. 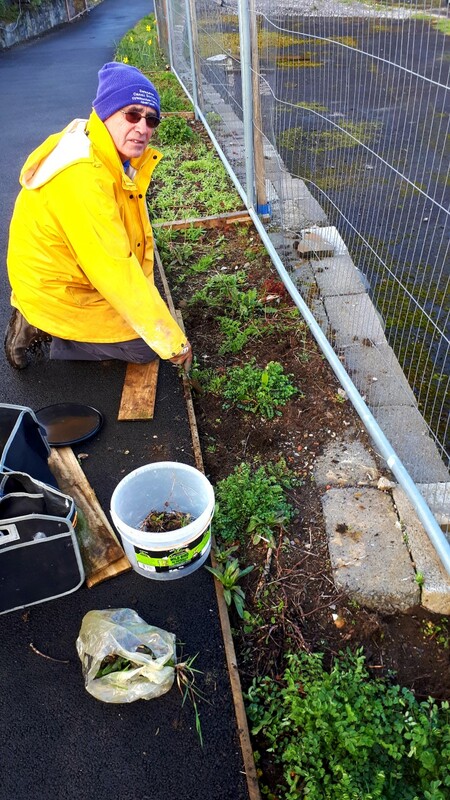 Other volunteers were engaged in cleaning canoes and kayaks for the forthcoming boat season, but more of this in the next working party. 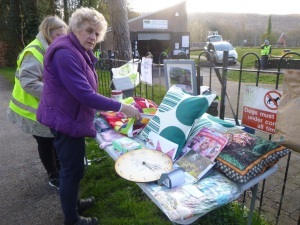 A marvellous effort by all the volunteers; well done everyone, particularly Gill for providing the cake! 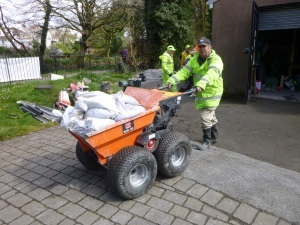 Well done everybody,great to see so many people busily engaged although I felt very much surplus to requirements. It would be great to see other people’s comments even if they were there on the day. So please put fingers to keyboard and make a comment! The bloggers would be greatful.